When it comes to reading, knowing and recognizing your letters it’s incredibly important. This is especially vital for children who are just learning how to read on their own. Sometimes, approaching such a big new skill can be intimidating for kids and they may feel uncomfortable or afraid of learning. With 26 letters, kids may feel afraid that remembering all of them will be difficult, and as a parent it may be hard to get them to want to try. Our new award winning personalized book I See Do You See? Alphabets can help when it comes to coaxing kids into reading, especially on their own. I See Do You See? Alphabets will set kids on an adventure where it is up to them to find the letters of the alphabet. Not only will they be looking for letters and becoming familiar with them, but they will also have to look for words that start with the missing letters as well. This will help kids get to know what their letters look like and help them make associations with related words as well. By sending them on an adventure, kids will be excited to learn about and find the letters in the story. This creative tale will call children by name and put them right in the middle of the action, making them the hero of their very own educational adventure. Personalized books are great for boosting confidence. Kids will feel more of a sense of purpose and excitement when they see their name printed directly into the story. This boost in self-confidence can help reluctant readers gather the courage to learn to read, to become familiar with the letters of the alphabet, and to save the day. Want to learn more? 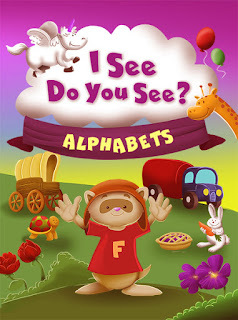 Take a virtual tour of I See Do You See? Alphabets where you can see the illustrations and read the entire story of our new alphabet book. Let the alphabet adventures begin…!